Calling this one done, although that's subject to change as usual. In explanation of the title, Alfa Romeo produced special bodied versions of the Giulietta (1300cc) and Giulia (1600cc) designed by Bertone and called Sprint Speciale. These beautiful cars were built from 1959 - 1966 and are pretty rare. This particular one was spotted at Lime Rock Park race track on a misty, showery spring morning and I've been intending to do a painting of it for several years. Good gosh, how did you do this? Awesome work. Very cool. I look at this and wonder about the tire tread if it will hold the road in this rain. Haha. Must be a realistic painting to get me off on that road safety tangent. Nice textures work. Good comparison of the shiny surfaces broken up by the water drops. Un maravilloso enfoque del automóvil. A wonderful approach to the car. 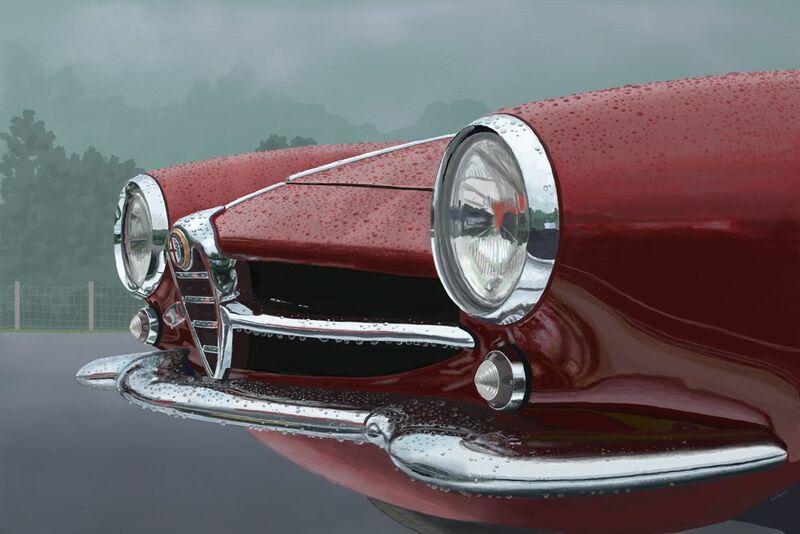 The details, the reflections…those incredible rain drops! I’d be very interested in watching the script playback. There’s so much here from a technique standpoint to learn from (and envy). I have been watching your painting emerge step by step and boy what a great painting the final product is. Wow this is fantastic, the detail in the body work and the amazing chrome. You paint better than I photograph.